Due to the seaside working environment, the shipbuilding industry frequently encounters the problems of corrosion of newly blasted steel surfaces. Oxidization occurs almost immediately after sand blasting of steel surfaces when the ambient relative humidity is high (>80%RH). To avoid damage, it is common practice to blow very dry air on the surface between the sand blasting and protective coating stages. Shipyards commonly use industrial dehumidifiers to blow dry air over the blasted surfaces. Unfortunately, the dehumidifiers currently available are extremely large and heavy, and consume a great amount of electricity. DHD Series 8000 and 18000 are new, super high efficient dehumidifiers capable of the same or better performance, while smaller in size and approximately half the weight of comparable dehumidifiers. Most important of all, by utilizing advanced heat pipe technology, the DHD Series uses only about half the electrical power of conventional dehumidifiers. In addition, the DHD Series provides hot drying cycle to cure coatings even quicker. 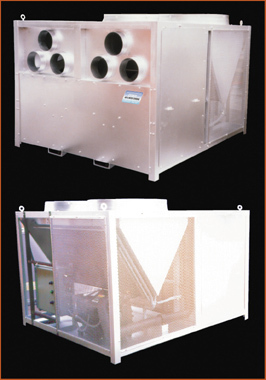 The DHD 8000 and 18000 are designed and manufactured by Advanced Dryer Systems, Inc. of Alachua, Florida, USA ad distributed in Asia by Dinh Air and Water Systems, Pte. Ltd. in Singapore. All dehumidifiers based on refrigeration principle use a compressor to cool the air in order to extract moisture. The cold air then must be heated back up to reduce its relative humidity. The drier the air, the better it helps the unprotected surfaces from corrosion. The hotter and drier the air, the shorter the time for fresh paint to cure. How is the Heat Pipe Applied in the Dehumidifier Dryer Machine? First, one section of the heat pipes passively precools the entering air to reduce the load on the refrigeration system. Then by using the energy absorbed from the first heat pipe section, the second section releases this energy back into the supply air in form of heat to lower air relative humidity. Result: About half the energy is saved! Cold Supply Side Air Temp. 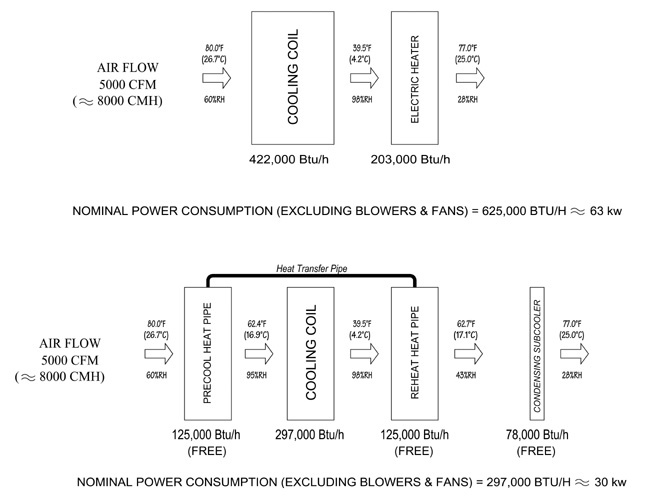 Hot Supply Side Air Temp.